The course is designed for a maximum of ten participants on a single basis, or a maximum of 12 with a mixture of single and shared occupancy. This ensures the optimal level of comfort and attention to your writing from the visiting writing tutor, both in a group setting and one-on-one. The beautiful Casa Ana is our working base for the week. Rooms are sold on a first-come, first-served basis, on a single occupancy priority basis. Please note however that if you wanted to come as a couple, or with a friend, we are able to offer two of the rooms on a sharing room basis should they be available at the time of booking, of £695 per person. We therefore recommend early booking if you are planning to come with a friend or partner. Click on the room number below for more information. The Wisteria Room is a spacious double room of approximately 21.5 sq m on two levels, with a double bed (150 cm wide, 190 cm long) and an additional single bed. It has an en suite bathroom. The room was once used for storing olive oil and we still have some of the large earthen pots in which the oil was kept. The Wisteria Room is accessed via several shallow steps which lead down from the main entrance of Casa Ana to a small central courtyard. The bedroom door gives onto the courtyard, near the main door which leads to the dining room. The bedroom window is west-facing and looks out to the garden. 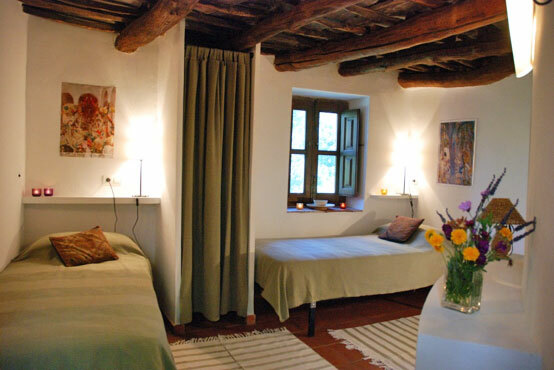 The room is simply and beautifully finished with white walls, the original chestnut roof beams and terracotta floors scattered with rugs. In winter there is underfloor heating throughout – even in the bathroom. In summer the 2 ft thick old walls keep the room cool. The furniture includes a fitted writing desk with chair, fitted cupboards with shelves and hanging space, bedside shelves with lamps, a wicker chair and mirror. The bathroom is decorated with blue and white handmade tiles, the designs inspired by the Moorish mosaics at the Alhambra palace. The bathroom includes a rain shower, toilet, basin and large mirror. The Terrace Room is a cosy twin-bedded room, given its name because of the French doors that lead out onto a south-facing terrace. The room is approximately 11.5 m2 with two single beds (90 cm x 190 cm) and an en suite bathroom. The room is in the main house, and is accessed via several shallow steps down from the street entrance of Casa Ana. It is situated close to a small courtyard, as well as the south-facing terraces, the garden and the dining room. From the terrace outside the room there are stunning views of the valley and mountains beyond. A traditional shuttered window looks out onto the courtyard. The room is simply and beautifully finished with white walls, the original chestnut roof beams and a terracotta floor scattered with rugs. The furniture includes a fitted writing desk with a chair, a fitted cupboard with shelves and hanging space and bedside shelves with lamps. The bathroom is decorated with handmade tiles in shades of pale green and bone, the designs inspired by the Moorish mosaics at the Alhambra palace. The bathroom includes a rain shower, toilet, basin and large mirror. The Old Woodstore is a light and airy double room of just under 10 sq m, with a double bed (135 cm wide, 190 cm long). The room is situated in a single-story building (it really was the Old Woodstore) which adjoins the main house. The room is accessed via several shallow steps leading down from the main entrance of Casa Ana to a small central courtyard. It is situated off the courtyard and close to the garden and the dining room. French doors lead out onto a terrace, and a large south-facing window provides superb views of the Trevelez valley and the mountains beyond. The room is simply and beautifully finished with white walls, chestnut roof beams and terracotta floors scattered with rugs. In winter there is underfloor heating throughout – even in the bathroom. In summer the 2 ft thick old walls help keep the room cool. The furniture includes a fitted cupboard with shelves and hanging space, a wicker chair and bedside tables with lamps. The adjacent bathroom is decorated with blue and white handmade tiles, the designs inspired by the Moorish mosaics at the Alhambra palace. The bathroom includes a rain shower, toilet, basin and large mirror. NB. The Old Woodstore building also houses a single bedroom (Room 4). This room is sometimes used when groups come to Casa Ana, in which case the bathroom will be shared by guests in the Old Woodstore and Room 4. The Old Woodstore Single is a light, airy small room of approximately 6.5 sq m, with a single bed (90cm wide, 190 cm long). The room is in a single-story building (the Old Woodstore) which adjoins the main house. The Old Woodstore Single is accessed via several shallow steps leading down from the main entrance of Casa Ana to a small central courtyard. This room is situated close to the south-facing terraces, the garden and the dining room. 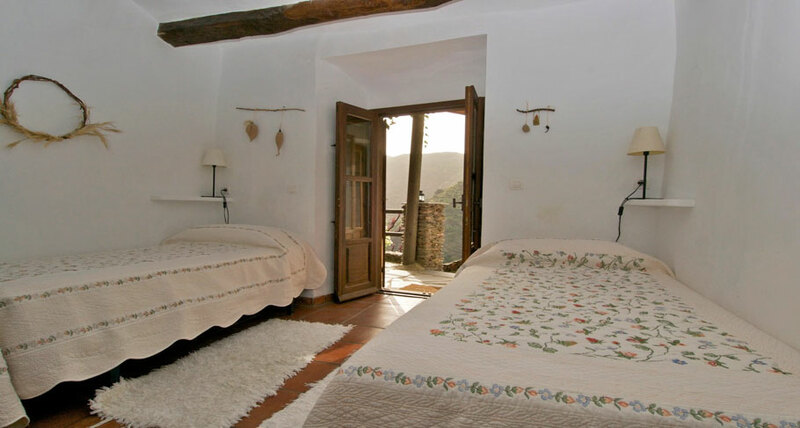 A large south-facing window provides superb views of the Trevelez valley and the mountains beyond. The room is simply and beautifully finished with white walls, chestnut roof beams and a terracotta floor with a thick cotton rug. The furniture includes a fitted cupboard with shelf and hanging space, additional fitted shelves and a bedside shelf with a lamp. NB. The Old Woodstore also houses a double bedroom (Room 3). This room is normally used when groups come to Casa Ana, in which case the bathroom will be shared by guests the Old Woodstore Single and Room 3. The Old Stables room is a rustic and spacious twin bedroom of approximately 13.2 sq m, with two single beds (90 cm wide x 190 cm long). The room is in a single-story building (the Old Stables) situated just beyond the garden. The Old Stables room is accessed via several shallow steps leading down from the main entrance of Casa Ana to a small courtyard and then a few more steps down to the bedroom door. It is situated close to the south-facing terraces, the garden and the dining room. A large south-facing window provides superb views of the Trevelez valley and the mountains beyond. The room is simply and beautifully finished with white walls, chestnut roof beams and a terracotta floor scattered with rugs. In winter there is underfloor heating throughout – even in the bathroom. In summer the 2 ft thick old walls help keep the room cool. The furniture includes a fitted cupboard with shelf and hanging space, additional fitted shelves, bedside shelves with lamps, a wicker chair and a mirror. The adjacent bathroom is decorated with handmade tiles in shades of green and bone, the designs inspired by the Moorish mosaics at the Alhambra palace. The bathroom includes a rain shower, toilet, basin and large mirror. NB. The Old Stables also houses a single bedroom (Room 6). 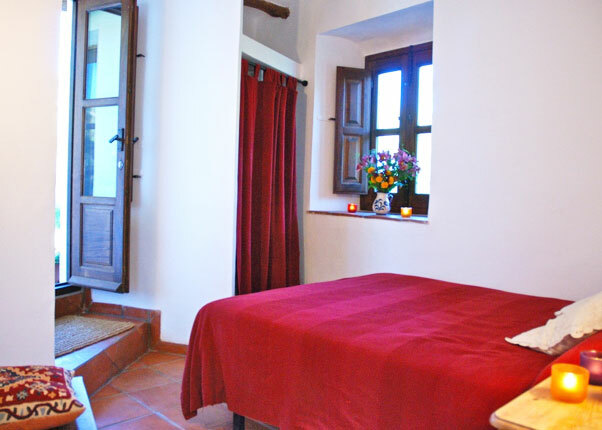 This room is sometimes used when groups come to Casa Ana, in which case the bathroom will be shared by guests in the Old Stables twin and 6. The Old Stables Single room is situated down a flight of steps from the garden, close to the south-facing terraces, the garden and the sitting room. A large south-facing window provides superb views of the Trevelez valley and the mountains beyond. 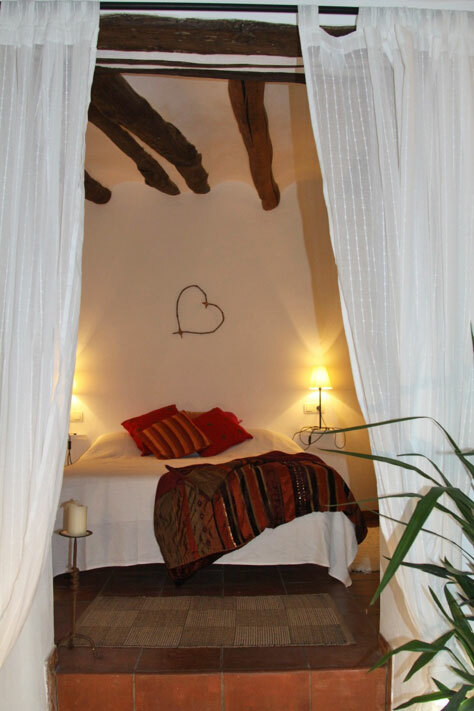 The room is simply and beautifully finished with white walls, chestnut roof beams and a terracotta floor with a thick cotton rug. In winter there is underfloor heating throughout – even in the bathroom. In summer the 2 ft thick old walls help keep the room cool. The furniture includes a fitted cupboard with shelf and hanging space, a chair, a bedside shelf with a lamp and a mirror. *NB. The Old Stables also houses a twin bedroom (Room 5). This room is normally used when groups come to Casa Ana, in which case the bathroom will be shared by guests in Rooms 5 and 6. Bedrooms 7 and 8 are both double bedrooms of approximately 12 sq m plus en suite bathroom. The rooms are located down a flight of steps from the garden. They have south-facing French doors with views across to the Sierra Mecina – a range of hills at the top of the Trevelez river gorge. 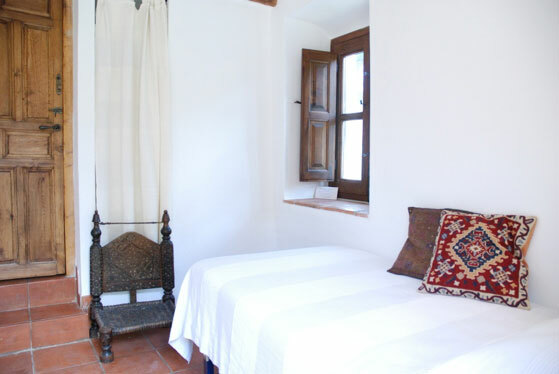 The rooms is simply and beautifully finished with white walls, chestnut roof beams and terracotta floors scattered with rugs. They are furnished with a double bed (135 cm wide by 190 cm long), two bedside tables with lamps, a chair, a small writing desk and fitted cupboards and shelves. In winter there is underfloor heating throughout – even in the bathroom. The bathroom is decorated with traditional Moroccan stucco and hand made tiles, the designs inspired by the Moorish mosaics at the Alhambra palace. The bathroom includes a rain shower, toilet, basin and large mirror. The Garden Studio is a light and airy single room of approximately 7 sq m, with an en suite bathroom. It has a single bed (90 cm wide x 190 cm long). 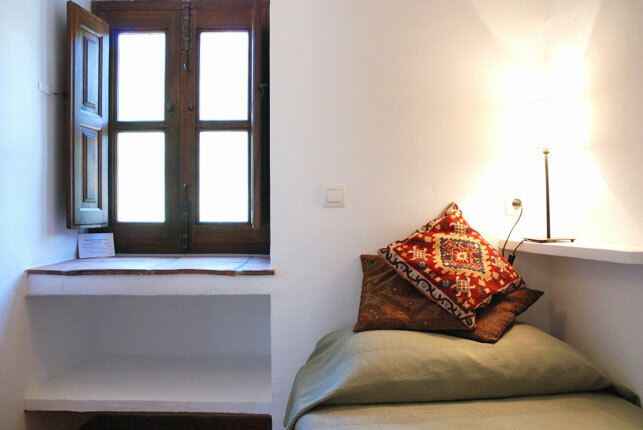 The room is in a small, studio-style building which is accessed through the garden, (a few steps away from the main entrance of Casa Ana), then up a few steps. The room is situated close to a large garden terrace and the dining room. South-facing French doors lead onto a small balcony with exceptional views over to the Trevelez valley and the mountains beyond. In winter there is underfloor heating throughout – even in the bathroom. In summer the mountain breeze helps keep the room cool. The furniture includes a fitted cupboard with shelves and hanging space, a chair, a bedside shelf with a lamp and a mirror. The en suite bathroom is decorated with creamy stucco. It includes a rain shower, toilet, basin and large mirror. Bedroom 10 is a spacious double bedroom of approximately 16 sq m plus en suite bathroom. It is suitable for wheelchair users, being large and with easy access (no steps or slopes). The room is located in what was once the village communal oven building. The bedroom has south-facing French doors that give onto the garden. The room is simply and beautifully finished with white walls, chestnut roof beams and terracotta floors scattered with rugs. It is furnished with a double bed (150 cm wide by 190 cm long), two bedside tables with lamps, an armchair, a small writing desk and fitted cupboards and shelves. The bathroom is decorated with handmade tiles in blue-green and bone, with white stucco walls, the designs inspired by the Moorish mosaics at the Alhambra palace. The bathroom includes a rain shower, toilet, basin and large mirror. Rooms are allotted on a first-come first-served basis. To book please call 020 7 324 2563 or email Aki Schilz on aki@literaryconsultancy.co.uk.